My first full-month menu was posted to this site on May 1st, 2015. We have gone through an entire year of meals together! I feel like that’s really something to celebrate…. but I’m not sure how to celebrate it. I guess the only way I can celebrate a full year of monthly menus is to post the May 2016 Menu! I cannot tell you how much I have enjoyed the last Foodie Friday of each month this past year. 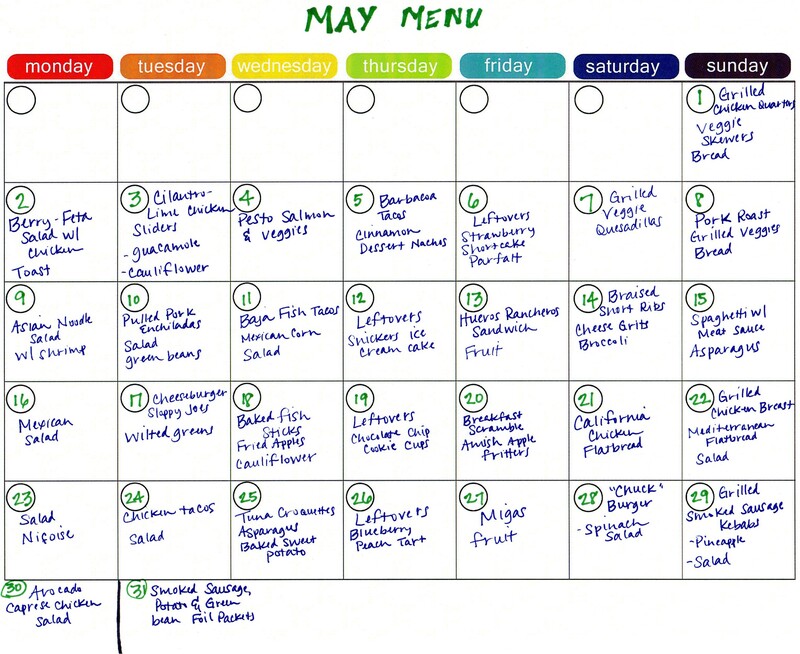 Planning out a full-month of dinners has really simplified my life. I have been planning my menus pretty much since I got married in 2006, but until last year, I only planned a week at a time. And each week was a struggle. On grocery day I would be sitting, pen in hand, with zero ideas for dinner. I thought planning out 30 days of dinners would be that much harder, but it’s not. It really is not. It’s more fun, and I can spread out the task over a whole month. I also always have something to look forward to, because there will be dinners on each month’s plan that I am really excited about. Here’s to another year of monthly menus from Jessica’s Kitchen Table! Don’t forget to check out my May 2016 Menu Pinterest Board for the recipes! On April 16, I ran in my very first 10K race. I am proud to say I beat my goal time, I didn’t fall down and I didn’t throw-up. It was really a lot of fun. I ran in the Remember the 10 race on the Oklahoma State University campus. This race is a memorial event to honor 10 members of the OSU family (involved with the basketball team) who lost their lives in a plane crash in 2001. It’s a great race and I love running through the OSU campus. My mom and my twin sister ran the 5K, and my husband and I ran the 10K. We all rode to Stillwater together and got lined up. Let me just say, running with family is wonderful! It’s a great way to spend the day together, doing something that makes us all stronger and healthier. I also want to say something about the running community in general: If you run, you are a runner. It doesn’t matter if you run for 30 seconds and then walk for 2 minutes, and continue for 1 mile or 26 miles. You are a runner. These races are so much fun because very few people are there to win. For many of us, meeting our own goals and beating our own records is enough. Just finishing is an accomplishment. When 100, 1,000 or 5,000 runners are milling around, waiting for a race to start, there is an electric charge in the air. Everyone is anxious and excited. While running, complete strangers encourage one another. It’s a great feeling! When I was getting tired and wanting to stop and walk a little while, the runners around me encouraged me to keep going. It helps. It really does. And it gives you the warm fuzzies when you know that you may have helped someone else simply by being there. Having Zach with me definitely helped my time. He used his fancy GPS watch to make sure that we met our goal. He also pushed me to run a lot more and walk a lot less than I am used to. I have typically been running miles 1, 3, an 5 and mostly walking miles 2, 4, and 6. He made me run to each mile marker and then only let me walk for 15 seconds. I ended up getting a PR (personal record) for my fastest ever 5K and then my fastest ever 10K (though it was only my second ever 10K). This is me with my sister and mom. I’m sorry that I didn’t get a picture of Zach and me together. QuickTip Tuesday: No time to read? I love to read. I love stories and I miss reading novels. I am a graduate student, so most all of my reading is academic (textbooks, science journals…). I also commute 40 miles to school, so I spend a LOT of time in my car. I may be behind the times, but I recently discovered an app for audio books. I have bluetooth connectivity in my car, so I can listen to an audio book from my phone through the speakers in my car. It’s awesome! I have been listening to books all semester during my commute. I LOVE IT! You should try it. While it is hard to resist the lure of spring’s warmer temperatures by airing out the house, be sure to watch small children and pets around open windows. One of the most high-profile cases involved rock musician Eric Clapton’s 4-year-old son, Connor, who tragically died in 1991 when he accidentally ran through a large open window and fell 49 stories. It can happen to any child, anytime and anywhere. In fact, the U.S. Consumer Product Safety Commission indicated an average of eight children age 5 and under die annually as a result of falling out of windows and 3,300 sustain injuries from window falls. Children and even pets fall out of open windows more often than people realize. Window screens are supposed to keep out pests and bugs. They aren’t designed to prevent a child or family pet from possibly falling out of an open window. The good news is, there are lots of easy, low-cost precautions you can take to keep you children safe. For instance, keep windows closed and locked when children are around or, if a window is open, ensure small children cannot reach it. Also, double-hung windows should be only opened at the top, if possible, rather than at the bottom. Furniture, such as beds and cribs, should be arranged away from windows to discourage children from playing or climbing near windows. Pay special attention to windows near window seats where children may like to play or sit. According to the “Safe Kids World Wide 2015 Report to the Nation: Protecting Children in Your Home,” about 70 percent of parents surveyed said they never used window guards or stops to prevent windows from opening. However, installing these safety devices can provide an extra layer of security against accidental falls. Coming in a range of sizes and adjustable for width, window guards can be screwed into the sides of window frames and feature bars spaced no more than 4 inches apart. Window stops only allow windows to open 4 inches or less, no matter whether they open from the bottom, top or side. **If you decide to use window guards or window stops, be sure they can be easily opened by an adult or older child in case of an emergency such as a fire. Americans spend a LOT of time sitting. We have moved from a society with largely physical jobs to a society with an inordinate amount of office jobs. I know I spend way too much time sitting on my duff at my computer, then I go home and sit on my duff in my living room (when I’m not gardening, or training for races, or chasing my 2 littles… you get it). The point is, we spend approximately 8 hours a day sitting in our jobs, and then some more time sitting at home. We can easily be more active at home, but being more active at work requires some creativity. Take “brain breaks”- every 20-30 minutes, move away from your computer. Rest your eyes. Move around. Stretch. You can dance if you want to. Have “walk and talk” meetings. If you need to have a little pow-wow with your co-workers to discuss your schedules or policies, walk around the block while you talk. Please share your ideas! I know I would love hear (and try) them! It has recently been all over the mass-media that genetics play a big role in whether or not we like cilantro. According to those large news outlets, people either love it or hate it. I don’t know if this is true, but I personally like it sometimes and then like it a little less at other times. There are dishes that I make that are greatly improved by adding cilantro, and then there are dishes that I would rather leave it out…. Anywho, whether you love it, hate it, or like it sometimes and don’t like it other times, here is a picture of the cilantro I started in an egg carton. Cilantro has anti-microbial properties- it’s particularly effective against salmonella! It also has great vitamins and minerals like potassium and vitamin A. If you don’t it, try it in your Tex-Mex dishes. You’ll be glad you did! I saw a very expensive seed-starting apparatus in a seed catalog and wanted it immediately, but it was so expensive. I perused Pinterest for less expensive methods to start my own seeds. I tried two. The first was to plant the seeds in ice cream cones. The blogger who shared this idea boasted that it was great and you could just plant the entire cone into the ground when it was warm enough and your plant was established. Great! I’ll try it. Ice creams cones are like 25 for $1. 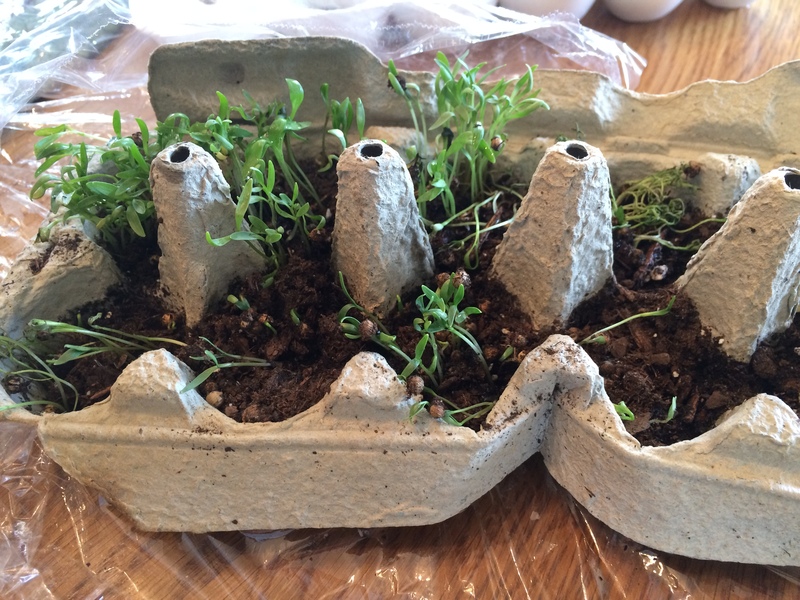 I also saw an idea where you start the seeds in egg cartons, then wrap the egg carton in plastic wrap. I have egg cartons. I have (some) plastic wrap… what’s the worst that could happen? First, I didn’t have enough plastic wrap, so one egg carton was wrapped up well and one egg carton had a small piece of plastic over the top. The second carton got really dry really fast, but the little sections flood with just the smallest amount of water. You really want the soil to stay moist, but you don’t want it floating in water. Second, the ice cream cone method dried out very quickly- because it wasn’t wrapped in plastic wrap. Then, it molded. Yuck! I wanted to try to save my flowers, so I peeled the moldy cones from the teeny little flowers and put the soil clumps down into an egg carton- then I wrapped it up. I have bought more plastic wrap and re-wrapped everything. 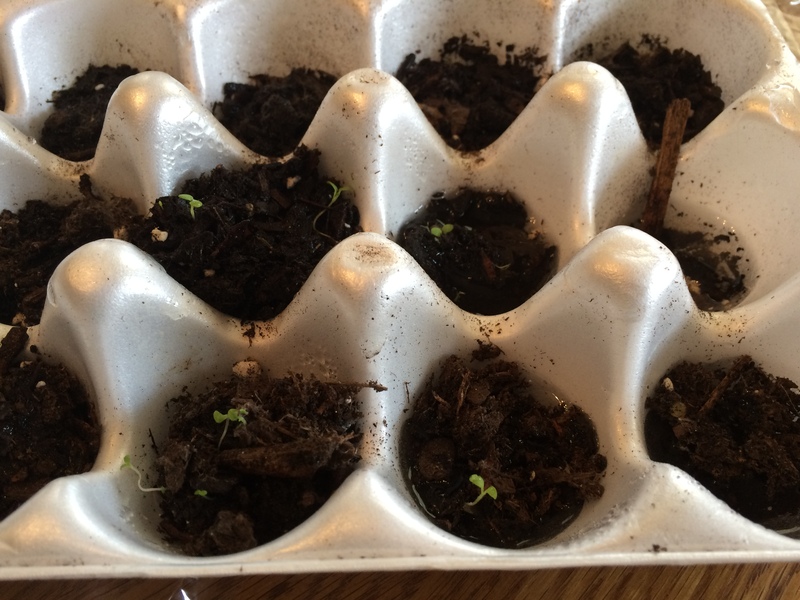 The egg carton that was done correctly from the beginning has beautiful little sprouts of cilantro- which we love. 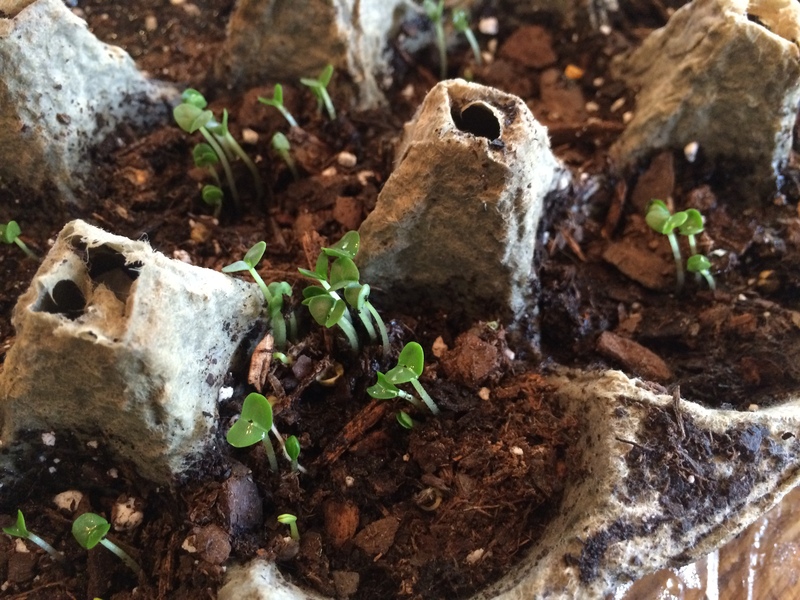 The others had some teensy little sproutlets of petunias and basil. I also planted lavender, but I haven’t seen any yet. I am watching and waiting to see how well this works. If it doesn’t, I guess I wasted about $7.